Yankees DH Alex Rodriguez tosses his bat after belting a home run in the sixth inning. 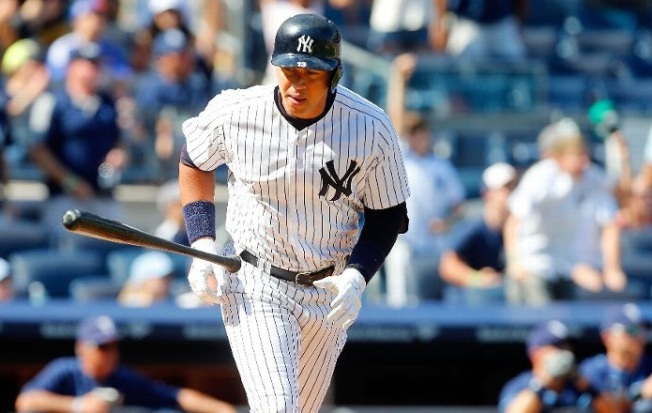 Brian McCann and Alex Rodriguez hit back-to-back homers off All-Star starter Chris Archer that sent the New York Yankees past the Tampa Bay Rays 6-4 on Sunday. Ivan Nova pitched six solid innings to help the Yankees take two of three in the series. New York, which leads the American League wild-card chase, remained 1 1/2 games behind first-place Toronto in the AL East. The Blue Jays beat Baltimore 10-4. On a picture-perfect afternoon in the Bronx, Archer was doing what he's always done -- dominate the Yankees. The 26-year-old righty, who had never lost to New York, kept hitters off balance with a slider that opposing manager Joe Girardi suggested might be the best in the game. That was, until the sixth inning. After the first 18 Yankees batters were held to one hit, New York finally broke through and erased a 3-0 deficit. Archer (12-11) got two outs sandwiched around Jacoby Ellsbury's single, but then began having trouble with his control. Following a walk to Carlos Beltran, McCann drove a 3-1 pitch deep into the right-center bleachers to tie the score at 3 -- his career-high 25th home run. Archer, who had allowed only one home run in eight previous starts against New York, saw his very next pitch to Rodriguez also wind up in the seats, giving the Yankees 4-3 lead. New York added a run in the seventh when Didi Gregorius scored on a throwing error by second baseman Logan Forsythe.